Who wants to be in the Wedding Party? Everyone wants to be in the wedding party! Peg & Pog had to hold back the nominees for the various traditional ‘roles’ in their wedding party. 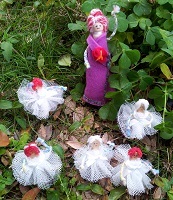 Of course they didn’t like to disappoint anyone, or in their case, any dolls. Feelings need careful handling. 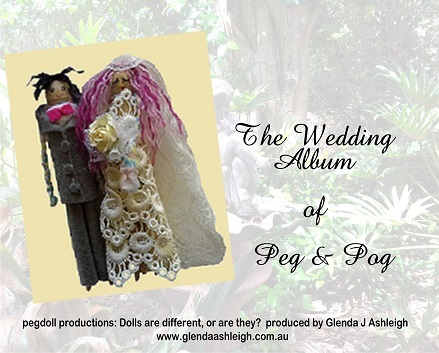 Peg & Pog knew what they wanted, and what they didn’t want for their big day. Unfortunately, their ideas and wishes were not always shared by family and friends. 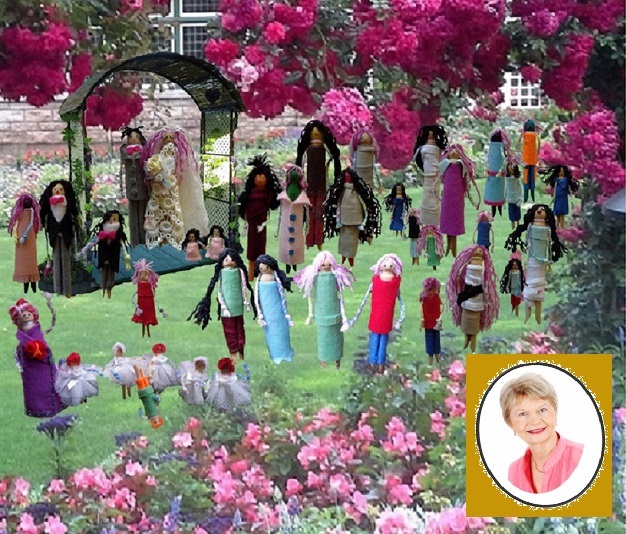 Fortunately, Peg & Pog, assisted by Glenda, the Very Good Celebrant, got the wedding they wanted. This is the tricky part. Members of the wedding, or bridal party are usually people who are important to you such as family and friends. For those of you who are blessed with large, extended families and a lot of great friends, this can become a nightmare! Whatever you do, choose very carefully. Your attendants can make or break the best of well-laid plans. Adult attendants need to be reliable and trustworthy. Ask yourself the question, “How can this person support our needs leading up to and on our wedding day?” After all, that is what attendants do – support the Bride and Groom in the planning and organisation of the big day both before and on your wedding day. Milo, Pog’s brother, supported Peg & Pog in organising people on the wedding day and introducing Glenda, the Very Good Celebrant to the parents and the witnesses. 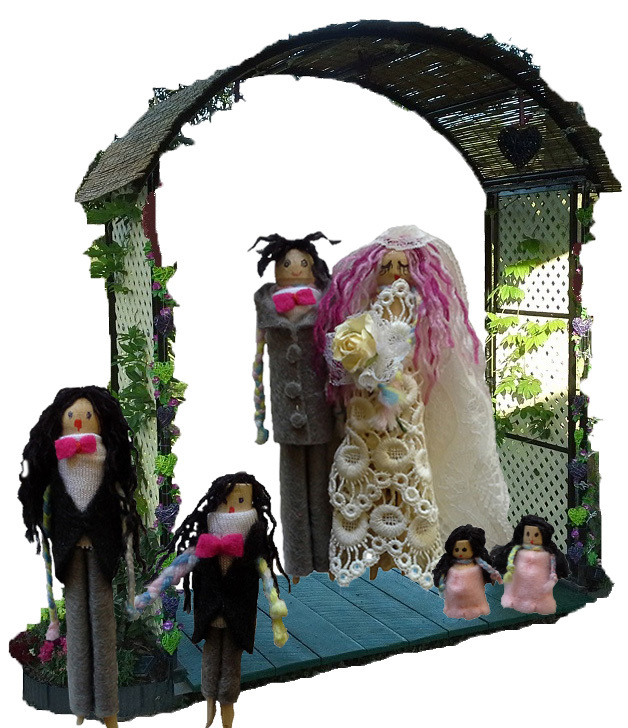 Peg & Pog had asked two adult family members to be their witnesses – Peg’s Ma and Pog’s Ma! Both mothers wanted to be front and centre during the ceremony so that they got the full experience of watching and hearing their children say their marriage vows. Be prepared for the unexpected when choosing children as attendants! Little ones may look ‘cute’ on the day, however their welfare is the most important consideration. Expecting young children to walk down paths on their own is daunting enough. Asking them to carry precious items such as ring cushions etc. only adds to their stress. Pip & Pepper, Pog’s two-year-old twin nieces were fine as they accompanied Peg on the flower boat but as soon as they hit land, they took off! 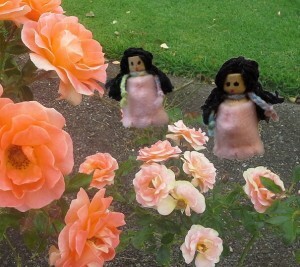 Luckily the shortcut they took to the Rose Garden didn’t become a disaster and they arrived just as Peg & Pog were coming up the path. How Many in a Wedding Party? As many as you like! Bride and Groom only if you prefer. The two witnesses don’t have to stand or sit next to you, unless you think you might be given to an attack of the vapours and faint. Oh, and it’s not an equal sharing competition either! Just because the Bride has three attendants, it doesn’t mean that the Groom has to have three attendants. Gender is not important. A ‘Matron or Maid of Honour’ can easily be a ‘Man or Mate of Honour’ – the choice is yours. More wedding party news later. 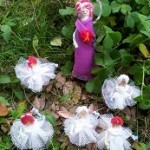 In the meantime, check out some things you may or may not know about Glenda, the Very Good Celebrant! Most people think of their official Marriage Certificate as the one they receive on their wedding day. Actually, the number of Marriage Certificates signed at a wedding varies depending on who officiates at the wedding ceremony. For example, there are only two Marriage Certificates at State Registry Office Wedding. 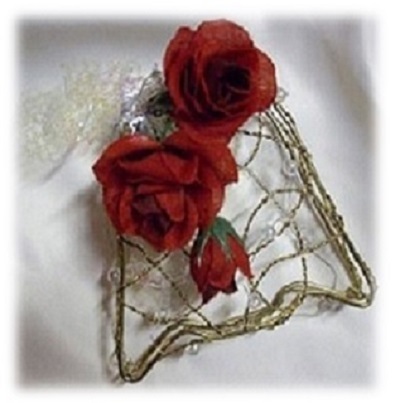 There are three Marriage Certificates at a civil or religious weddings. 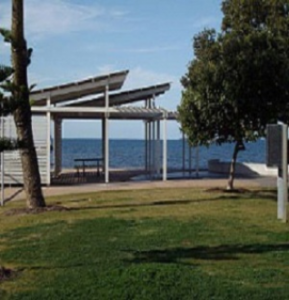 A Commonwealth-registered Marriage Celebrant (CMC), or a designated person of a religious organisation approved by the Australian government officiates at these wedding ceremonies. 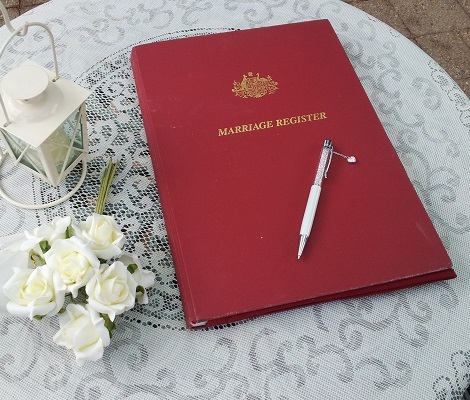 The first Marriage Certificate is in the Marriage Register book which I keep securely as the authorised Celebrant. 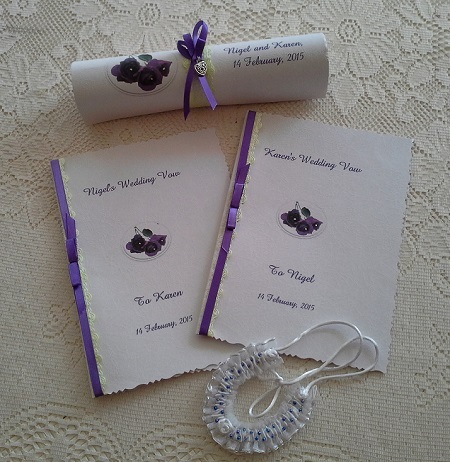 This certificate contains all the personal identity details of the Bride and Groom, including their birth dates. The second Marriage Certificate is the Presentation or Ceremonial Marriage Certificate and this is the certificate that I present to the Bride and Groom at the end of the ceremony. The third Marriage Certificate is the Official Marriage Certificate. This certificate contains all the personal identity details of the Bride and Groom, including their birth dates. The Commonwealth-registered Marriage Celebrant (CMC), or a designated person of an Australian government approved religious organisation, submits this third certificate to the Registry of Births, Deaths and Marriages in the State/Territory where you marry. I send this certificate as soon as possible after the wedding ceremony. The legal document that not only establishes your identity but also shows the details of your marriage, is the copy of the Official Marriage Certificate certified by the Births, Deaths and Marriages Registry of the States/Territory where you marry. There is a charge for this certificate and prices do vary across State Registries. This Registry Certified Copy of Marriage Certificate is the legal document that establishes your identity and shows the details of your marriage. Finally, State Registries offer a decorative, Commemorative Certificate for a fee. This certificate is for display purposes only and is neither a legal document nor a proof of identity document. How many Marriage Certificates do you need or want? So, how many certificates do you need or want? That is up to you! If you want a certificate that you can use to change your name, then you need the copy of Official Marriage Certificate certified by the Births, Deaths and Marriages Registry of the States/Territory where you marry. Do you want more information about getting married and marriage documents? These links will help you to ask the right questions to get the right information.